of information on Early Coinage of the United States of America. 1792 Half Disme. MS-68 (NGC). A simply breathtaking representative of a classic numismatic rarity, this Superb Gem is the single highest-graded 1792 Half Disme known to the certification services. The obverse depicts the portrait of a symbolic female representation of Liberty, the legend, LIB. (liberty) PAR. (parent) OF SCIENCE & INDUSTRY, and the year, 1792. The reverse has the denomination, HALF DISME, and the words, UNI (united) STATES OF AMERICA surrounding an eagle. The coin's diameter is 17.5 millimeters; the weight is 20.8 grains; 89.24 percent fine silver with a silver content of 18.5625 grains or 0.03867 troy ounces. Over the centuries the untouched silver surface has toned to deep blue with touches of purple and light red, apparently from storage for years in a Wayte Raymond cardboard album in the mid 20th century. With extreme historical significance and undeniable rarity, the 1792 Half Disme holds the 18th ranking in the book "100 Greatest U.S. Coins" by Jeff Garrett and Ron Guth. Combined PCGS and NGC Population: only 1; 0 finer. 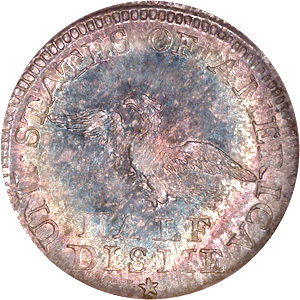 The 1792 Half Disme holds the title as the very first circulating issue of the new United States Mint. On April 2, 1792, Congress approved "An Act establishing a Mint and regulating the Coins of the United States." 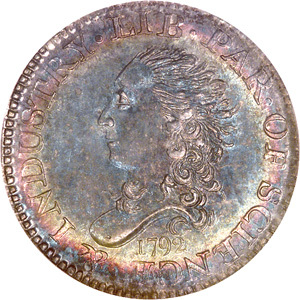 The Mint Act of 1792 provided for all of the denominations of circulating coinage, from half-cents through ten-dollar gold pieces, and included five-cent pieces termed "half dismes," which became the progenitor of what is now the modern circulating nickel. Under the Act, the Half Dismes were "each to be of the value of one twentieth of a dollar, and to contain eighteen grains and nine sixteenths parts of a grain of pure, or twenty grains and four fifths parts of a grain of standard silver." "...as small money is very much wanted we think proper, in the mean time, if your Excellency approves of it, to Coin some Copper Cents & Half Cents, and likewise small Silver, at least Dimes and Half Dimes. I have purchased on account of the United States, a House & Lot which I hope will be found convenient for the Mint but, considerable alterations must be made...I have likewise engaged Mr. Voigt to act as Coiner, and ... several workmen... I shall be happy in receiving your Excellency's approbation of these preparatory steps, together with such further directions as you may think proper to give." "Having had under consideration the letter of the Director of the Mint of this day's date, I hereby declare my approbation of the purchase he has made of the house and lot for the Mint; of the employment of Mr. Voight as Coiner...and proceeding to coin the Cents and half Cents of Copper, and Dismes and half Dismes of Silver." "The President having referred to me your letter of this day, I have it in charge from him to express to you his satisfaction at your undertaking the office of the Director of the Mint...He approves of the purchases you have made of the house and lot for the mint, of the employment of Mr. Voigt as coiner...and proceeding to coin the cents & half cents of copper & dismes and half dismes of silver." On July 11, 1792, Thomas Jefferson wrote in his personal account book, "Delivd 75 D at the Mint to be coined". This represented the official government reimbursement to Rittenhouse for the silver he had previously advanced on his own to make the coining blanks for the new half dismes. Since the first Mint building was not yet operational (still needing "considerable alterations"), the blanks were struck into coins in the cellar of John Harper's saw-making shop at the corner of Cherry and 6th Streets in Philadelphia. Quick work was made of striking the half dismes, and they were completed and picked up by Thomas Jefferson on July 13, 1792, as noted in his household account book, "Recd. From the Mint 1500 half dismes from the new coinage." With Jefferson's receipt of the newly minted half dismes in satisfaction of the $75 of government monies he had delivered two days earlier, the coins were officially monetized and ready for circulation – the very first official coinage of the United States of America. "In execution of authority given by the legislature, measures have been taken for engaging some artists from abroad to aid in the establishment of our mint. Others have been employed at home. Provisions have been made for the requisite buildings, and these are now putting into proper condition for the purposes of the establishment. There has been a small beginning in the coinage of half dimes, the want of small coins in circulation calling the first attention to them." As testimony to the desperate needs of the time, the new half dismes obviously circulated widely, and most survivors are very well worn and/or damaged. Only 250-400 examples of this issue are believed to remain from the recorded mintage of 1500 pieces, and just a small number have survived in Mint State. "1792 Half Disme. LIB. PAR. OF SCIENCE & INDUSTRY. 1792 (Liberty Parent of Science and Industry 1792). Bust of Martha Washington as Liberty to left. Rx UNI. STATES OF AMERICA HALF DISME* Eagle flying to left. Uncirculated. Obv. evenly centered; on upper edge across the top of the coin and just above the inscription it is not struck up and shows the file marks in the planchet. Rx not evenly centered, the milling only around half of it as it is struck a trifle low. This specimen has an interesting history being one of four that belonged to David Rittenhouse, the Astronomer and First director of the U.S. Mint, 1792-1795 and has never been out of the family until now. It is now a light steel color but perfectly uncirculated and a little gem of the greatest importance historically and a rarity too".